Our web design services are individually tailored for each of our customers. We will help you register that new domain name and work with you to develop your website's storyboard, choose and target keyword phrases specific to your business and design and publish your website. We will also help you evaluate your current website with an eye to improving your search engine rankings. 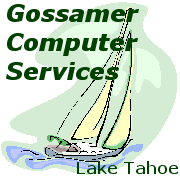 For a complete list of services please see Gossamer's Web Design.